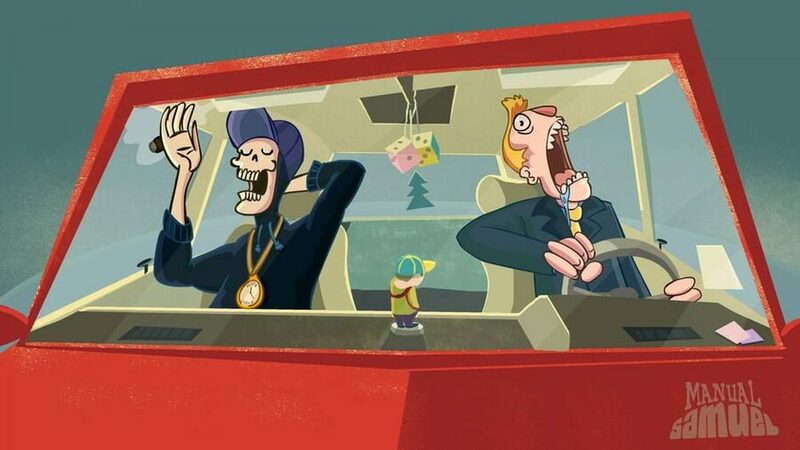 With an interesting combination of slapstick humour and dark themes, hilariously bonkers animated adventure Manual Samuel releases on Nintendo Switch today, 16th August. 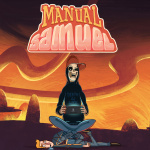 By performing everyday mundane tasks such as getting dressed and going to work, as well as basic human functions, Manual Samuel will test players' accuracy and improvisation while progressing through an increasingly surreal narrative presented in a vivid 2D hand-drawn art style. We talked to developer Perfectly Paranormal about the game. Nintendo Life: For those unfamiliar with the game, who is Samuel? Perfectly Paranormal: Samuel is the only son of a very wealthy power couple. He is brought up in wealth and prosperity. However, his parents haven’t paid much attention to him; they had maids and robots for that. Now, Samuel is living on his own in a huge mansion his parents gave to him. I think they were glad to get rid of him. However, his mom still sends maids and robots to his house for taking care of stuff. He never does anything that requires thought or skill. What kind of themes does the game tackle? One of the obvious themes is death. It is a scary subject and we’re all afraid of it, which is why we tried to make the concept as funny as possible. The other one is growing up. All adults have, in some way or another, been through what Sam goes through in this game; one day you wake up and you’re an adult who has to do everything manually like cooking food or paying taxes. What kind of sense of humour does it appeal to? The humour can get pretty dark so your morals have to be able to take a beating. It is also pretty stupid in what we hope is a funny way. So if you like dark and stupid things this game is for you. There are also some satire and parodies in the picture. We started developing the game after we were done with school and got real jobs. We had to do a lot of things manually like I mentioned above. That and lots and lots of stupid conversations we had on the couch, watching things like Arrested Development and The Hitchhiker's Guide to the Galaxy. We were also obsessed with Neil Gaiman’s and Terry Pratchett’s Good Omens at the time. We still are. Buy that book. Just do it. How did you balance portraying the dark themes with slapstick humour? We created a Venn diagram measuring the frequency of dark themes vs humour. Just kidding. We just made what we felt was natural and funny at the time. Apart from that, we didn’t really put that much thought into balancing things out. Is the plot influenced by a particular ‘real world’ story or experience? As mentioned, we were inspired to make the plot when we got jobs. We were teachers so we also interacted with a lot of young adults leaving home for the first time having to do things themselves for the first time. Some of them could be pretty spoiled, too, so we drew a lot of inspiration from that. (None of them were as useless as Samuel, though). The art style is very in line with the wacky nature of the game. How did it develop? We had an awesome art director at the time and she spent a lot of time researching to come up with a style that suited the game. 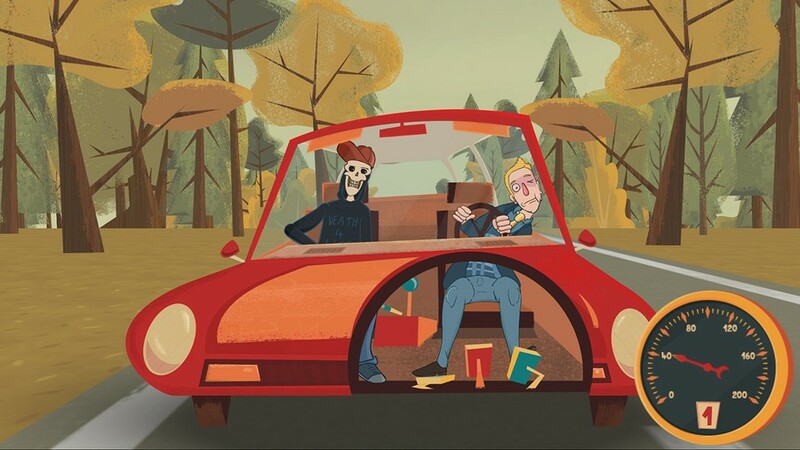 We wanted the game to look like old Hanna Barbera cartoons and went through many iterations before Manual Samuel looked like it does now. Her name is Delia Tomei. Check her stuff out. Our character designer is comic artist Øystein Sanne, and designing wacky characters for the game came like second nature to him. There are many everyday scenarios as well as more surreal moments. How was the selection process and were there any mechanics or situations you left out? We wanted the beginning of the game to be as mundane as possible and have it intensify to an epic biblical ending. So for each level, we were like, “OK how do we heighten the situation from the previous level?” We’re a very small team so we had to get to the point quickly. That made the escalation curve very steep! If we had more time, money and power in our hands then the situation would be more gradual. Samuel would go to a date where he had to behave or try to buy groceries without making a fool of himself. In addition, we would also have made Death more menacing, trying to sabotage Sam’s tasks. Right now he’s nicer but we’re happy with that. I’m not sure if he would show up again if we made him as menacing as we initially wanted but now he’ll be back soon for sure! Comedy is so subjective. How did you balance telling the story in the manner you wanted? Comedy is subjective but humans can be really similar. If you’ve ever had an idea, chances are a thousand people have had it before you. Just try Googling why you do something you thought only you do; Google will probably finish your sentence. It’s the same with humour, so we just made sure we thought things were funny. On top of that, we did a lot of testing and tweaked jokes that didn’t get any response at all; which turned out to be the ones we didn’t think were that funny to begin with. Then there were parts of the game that weren’t intended to be funny but people found to be hilarious anyway, so we just enhanced those moments. Was there anything you have tweaked or removed since the game’s initial release? We were too generous with Death barking lines at the player. We didn’t notice because we spent so much time with him but within a few days after release we halved his comments. He’s still annoying enough so it didn’t alter the character that much. We also made certain sections a little bit easier so everyone could enjoy the story. Are there any additions for the Switch version? We have some comics about Death that expand the Perfectly Paranormal universe a bit. So if you’re a fan of lore and whatnot, definitely check those out. We’ve also added a couple of features unique to the Joy-Cons, such as flicking the controller up to keep Sam’s spine in working order and using a split Joy-Con for the local co-op. On top of that, we’ve added in some new subtle details in the game to tie it together with upcoming games. 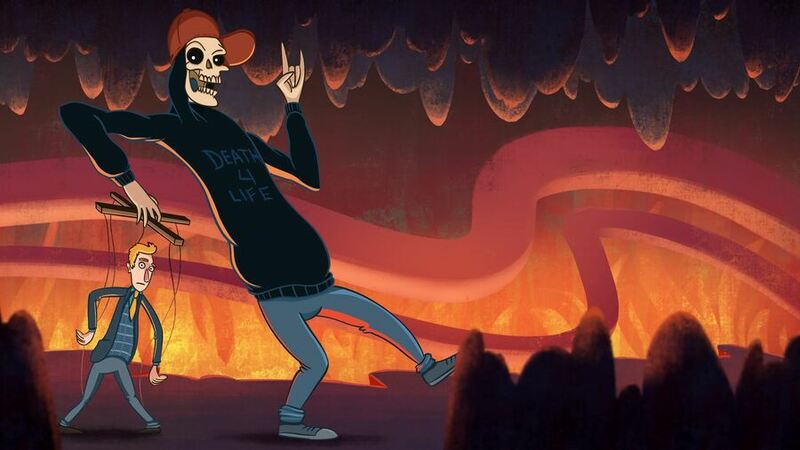 We didn’t know the ending of Manual Samuel actually wasn’t the end but just the beginning when we made the game. We know now. So look out for those details and start speculating! He is out there being a better man, appreciating life. He will show up again when you least expect it. We would like to thank Orzan and Gisle for their time. 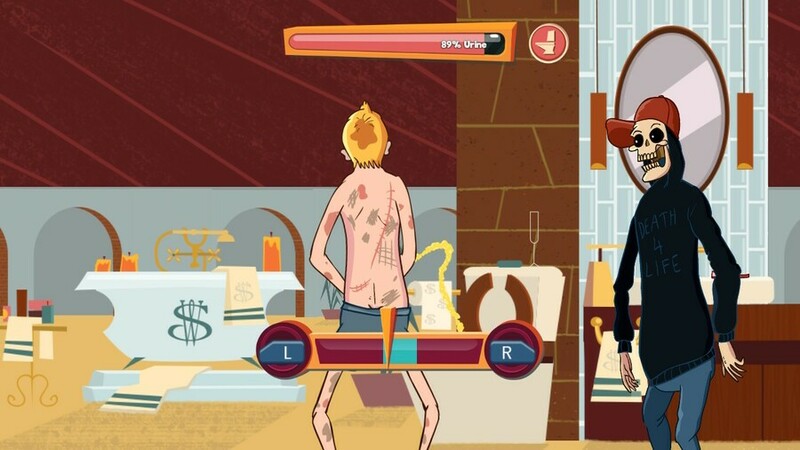 Manual Samuel will be available to download from the Nintendo Switch eShop starting from today. If you want to find out more - and whether or not the game is for you - make sure to check out our review! Wow the reviews of this one have been all over the place. From 3/10 to 9/10. There seem to be more negative critic and user reviews than positive ones, but it still seems pretty divisive. @BionicDodo it strikes me as a bit of a love it or hate it type of game anyway. Either that’s your kind of humour or it isn’t, I loved Monkey Island and the Discworld games so for me this is at least for a try. @CairiB Agreed, although interestingly Rockpapershotgun enjoyed the game but said they didn't really find the humour funny beyond the concept, which they found extremely funny. @BionicDodo interesting review thanks for sharing. I wonder if this is a case of humour being quite specific to culture/place? British black and/or sarcastic humour is often lost on others for example. The game mechanics sound from that review like it might be worth a play even if the final boss sounds like it might be a pain. @CairiB Given that review is 2 years old I hope that some of the issues with controls will have been fixed.